Locally founded in 1987, Discovery Maps are today nationally recognized as a leader in illustrated tourism maps. 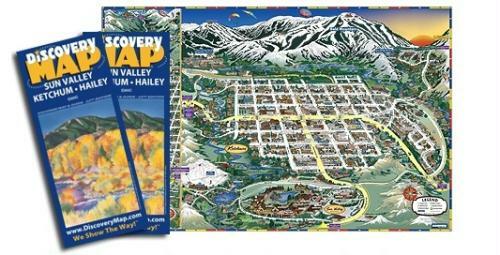 Co-founder Mary Sauerbrey actively promotes the Sun Valley/Ketchum & Hailey area by connecting businesses and services to area visitors through the 65,000 annually printed Sun Valley Discovery Maps and interactive web site. As the Discovery Map brand has grown amongst travelers to represent quality and content the company strives to stay on the cutting edge of the technological advances available to the industry. Discovery Maps interactive web site stands alone in appealing and connecting prospective travelers to their destination. Through web map and social networking apps we are able to market our community worldwide. If you have a business or service in the valley you a valuable thread that completes the fabric of our community. Are you missing out? Make sure your business is on the map, check out the Discovery Map website: Discovery Map. Call Mary at 720-1111 or e-mail: mary@sunvalleymap.com.